In the game last Sunday, Tech lost to Fort Hamilton. Although the team made a huge comeback in the third quarter, going from 18-3 to 19-18 when Terrance Battle blocked a Fort Hamilton punt, Tech ended up losing 36-21. Despite the outcome of the first game, Tech is looking for a comeback in this Sunday’s match against Grand Street. Grand Street also lost their last game to Flushing high school, 31-22. Tech beat Grand Street in 2010 and 2012, the score ending at 36-8. In the 2010 game, Tech ran about 270 yards. Senior Gino Nadela pounded out 137 yards on his own on 22 carries. He ran 63 yards in just the first quarter and set up a quarterback sneak by Kevi Shyti for a touchdown as well. Just as Coach McKenna said following the game in 2010, Brooklyn Tech has an outstanding offensive line. During the game in 2012 with Grand Street, Tech’s offensive line helped the offense get to a total of 307 yards. James Gales had 18 rush attempts, totaling for 182 yards, including three touchdowns. On average, Tech rushed about 8 yards per play. At the end of the game, they racked up about 220 yards in rushing. Grand Street, on the other hand, was only able to make one touchdown and had a total of 150 yards rushing. The Tech defense was also strong, with interceptions by Tyler Dougherty, Thomas Plonski and Kareem Ellis. Tech is looking for similar numbers this year. With their rigorous training every day and the focus of the whole entire team, they will look to work together as a unit to gain the first win of 2013. Game Preview by Zaria Holcomb of the Tech Sports Information Department. 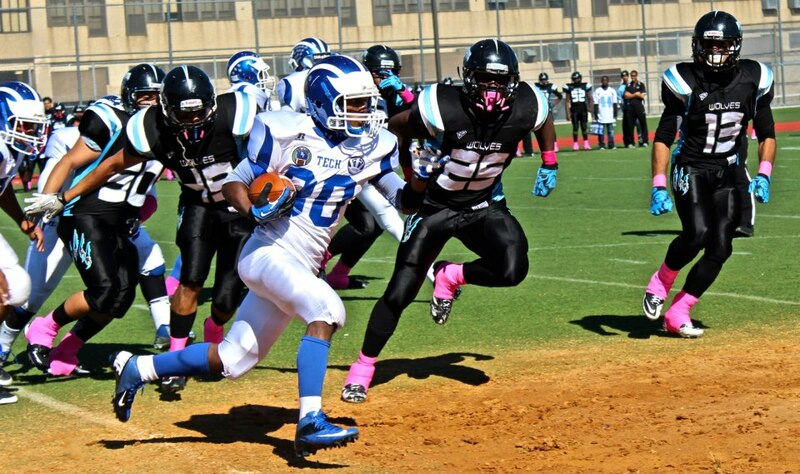 Picture: Tristan Brown runs the ball in 2012 game vs Grand Street Campus.